Napolitano Most Surprised By "Determination Of al-Qaeda"
Question: What was the most shocking, stunning thing that you found out of the review? And, Secretary, to you, as well. 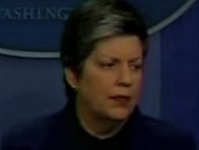 SECRETARY NAPOLITANO: I think, following up on that, not just the determination of al Qaeda and al Qaeda Arabian Peninsula, but the tactic of using an individual to foment an attack, as opposed to a large conspiracy or a multi-person conspiracy such as we saw in 9/11, that is something that affects intelligence. It really emphasizes now the renewed importance on how different intelligence is integrated and analyzed, and threat streams are followed through. And, again, it will impact how we continue to review the need to improve airport security around the world.